Knitting is finding a new generation of enthusiasts. More and more kids of all ages are interested in knitting and creating their own special clothing and accessories. Finally! 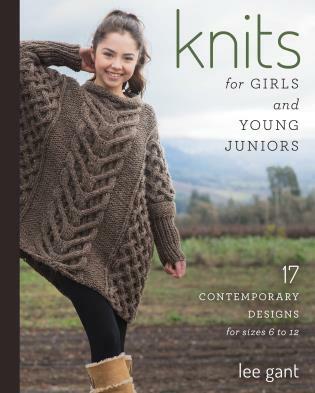 A collection of knits for girls and teenagers that suits their relaxed, comfortable, style! From high-textured cabled ponchos and sweaters to stockinette tops and dresses to warm, comfy coats, these pieces all share a carefree style your girls will love. Sized from 6 to young juniors 12, the patterns reach an often-missed generation of girls between toddler and adult. Yes, this age group can be tricky to please, so get them involved! Let them choose the pattern, the yarn, the fit (body-skimming or looser), and especially the color(s). Encourage them to personalize their design with the choices they make. Once exposed to the joy of creating a unique piece of hand-made clothing, they may even want to learn to knit for themselves! Lee Gant is a knitwear designer and author of Love in Every Stitch: Stories of Knitting and Healing. Her patterns have been published on Knit Picks and Patternfish and in 60 Quick Baby Knits and Ripley's 2013 Knitting Calendar, among others. She resides in Santa Rosa, California.